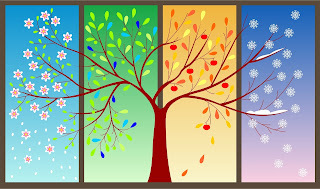 In the Western world we divide the year into four seasons: spring, summer, fall/autumn, and winter. The Spanish equivalents are primavera, verano, otoño, and invierno. 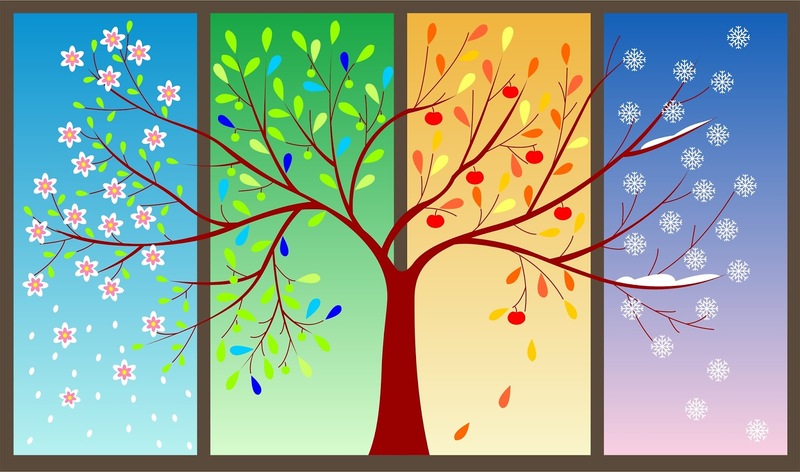 The reason for having four seasons seems to be that Latin also recognized four, known as vēr, aestas, autumnus and hiems. Actually, it seems that the primary or earliest season division in the Roman world was a dual one, between aestas, the warm part of the year and, and hiems, the cold part. Let us look at the four Latin names for the Roman seasons in turn and find out how they relate to the Spanish names of the seasons and to a few other Spanish and English words. The name for spring in Latin was vēr (genitive vēris, regular root vēr‑) ‘the spring’, a masculine noun. The adjective for this noun was vērnus ‘of or belonging to spring’ in classical Latin, but this was changed in Vulgar Latin to vēranus ‘of the spring’, used in the Vulgar Latin phrase veranum tempus ‘springtime’. This phrase would eventually turn into the word verano in Spanish, which in the middle ages referred to the spring. However, by the 16th century, Sp. verano it referred to the end of the spring, and the beginning of the summer. Eventually verano ended up replacing the word for summer, which had been estío (see below), which is now a formal or fancy word for ‘summer’. Sp. primavera ‘spring’, comes from the Vulgar Latin phrase prīma vēra ‘at the beginning of the spring’, from Classical Lat. prīmō vēr (same meaning), from primus ‘first’ (masculine ablative case: prīmō) and vēr (nom. and acc. 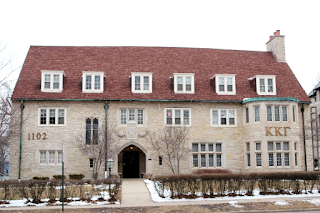 ; abl. vēre) ‘spring’ (vēr, like other third declension neuter nouns, later changed to being feminine). In other words, it would seem that the word for spring came to signify something like ‘warm times’ and the phrase that meant ‘first spring’ or ‘beginning of spring’ came to be the new word for ‘spring’ and the word for spring came to replace the word for ‘summer’. It is interesting that the word primavera is not attested in Spanish until the 15th century, though it is found earlier in Catalan and Italian in the previous century. Since the word is common also to other Romance languages, such as Portuguese, it is likely that it was a common Romance word from early on, but its increased use in Spanish may have been influenced by other surrounding Romance languages. Note that English too has borrowed the word primavera [ˌpʰɹi.mə.ˈvɛ.ɹə], primarily as an adjective used to describe dishes and meaning something like ‘made with lightly sautéed spring vegetables’ (COED). This modifier typically comes after the noun, as in pasta primavera or pizza primavera. According to the OED, this adjective ‘designat[es] any of various dishes, esp. pasta dishes, served with fresh vegetables and usually a light sauce’ and also ‘a sauce of this type’. As for the source for this English word, though the word does not seem to be used commonly this way in Italian, although the phrase alla primavera ‘in the style of springime’ is conceivable in this language. The adjective for Sp. primavera is primaveral ‘of spring, spring-like’. Note that whereas in the northern hemisphere, primavera refers to the period between March and June, in the southern hemisphere it refers to the period between September and December (the northern hemisphere’s autumn). And, as we shall see, in regions close to the tropics where only two main seasons are typically recognized, the term dos not have the same importance. As we said earlier, the Latin adjective for the word for summer vēr was vērnus, but Latin also developed another (rare) adjective from this word by means of the adjectival suffix ‑āl(is), namely Latin vernālis ‘of those things pertaining to the spring’. This adjective has been borrowed by Spanish but it is very rare, only found in phrases such as equinocio vernal ‘ spring equinox’. English too has the fancy adjective vernal ‘relating or appropriate to spring’, typically also only used in rare phrases such as vernal equinox, vernal breezes, or vernal bloom. Derived from aestas was the adjective aestīvus, formed with the adjectival suffix ‑īv(us) (aest‑īv‑us). This word was used, for example, in the phrase aestīvum tĕmpus ‘summer time/season’ and from the first part of the phrase, aestivum, would come the patrimonial word estío in Spanish, which was the word for ‘summer’ in Old Spanish and currently a fancy alternative for verano. Another, derived Latin adjective for the word for summer was aestīvālis, derived from the adjective aestīvus by addition of an additional adjectival suffix, again ‑āl‑(is) (aest‑īv‑āl‑is). Spanish has a fancy, learned adjective derived from this Latin noun, namely estival ‘of the summer’, as in época estival ‘summertime’. This word comes from the English too has borrowed this adjective (14th century) as estival (æstival in British English), which is also a fancy way to express the meaning ‘of or relating to the summer’, as in estival winds or estival blue. The word for ‘fall/autumn’ in Latin was autŭmnus (genitive: autumnī; regular root: autŭmn‑). It was used as a noun but also as an adjective, meaning ‘of the autumn/fall’. An early version of this Latin word was auctumnus, with a c, but its etymology is unclear. From this word comes Sp. otoño ‘autumn/fall’, which shows all but one of the expected sound changes, such as the simplification of the diphthong au to o, the change of short ŭ to o, and the change of mn to ñ [ɲ] (cf. Part I, Chapter 10). For some reason, however, the intervocalic ‑t‑ did not change to ‑d‑, as expected, probably by influence of the written Latin word at some point, since we would have expected a fully patrimonial word like this to change to odoño. In other words, the word seems to be semi-learned (Sp. semicultismo). Although the word could be used as an adjective, Latin also derived the adjective autŭmnālis by means of the adjectival suffix ‑āl(is) (autumn‑āl‑is). Spanish has borrowed this word as otoñal ‘of autumn/fall’, which has a cognate in English autumnal, ‘relating to, resembling, or associated with autumn’, as in the phrase autumnal colors. The autumn comes between summer and winter and it is associated with the losing of leaves by deciduous trees. In the northern hemisphere, the season is from September to December, but in the southern hemisphere, it is from March to June. As in the case of spring, many cultures have little use for the name for this season since it has no climate correlates in regions of the planet closer to the tropics. A further derived adjective for this season’s name in Latin was hībernālis or hiemālis, again derived by means of the adjectival suffix ‑āl(is) (hībern‑āl‑is or hĭem‑āl‑is). The Spanish equivalent is invernal ‘of the winter’. English also borrowed this as a fancy adjective in the early 17th century, namely hibernal ‘of, relating to, or occurring in winter’. English also borrowed the adjective hibernal in the 17th century, though it is quite rare. From the adjective hībernus, Latin derived the verb hībernāre ‘to pass the winter, winter, occupy winter-quarters’ (L&S). From the passive participle form hībernātus of this verb, English got its verb hibernate in the early 19th century with the meaning ‘to spend the winter in a dormant state’ (said of an animal or plant). The Spanish equivalent is the learned cognate hibernar, though Spanish also has the patrimonial verb invernar, which means ‘to spend the winter’ as well as ‘to hibernate’. Modern-day Germanic languages tend to also have four words to name the seasons, but only two of them are cognate across Germanic languages, which indicates that originally there were probably only two and that the two extra ones were added under the influence of Latin. The North Germanic languages, that is, the Scandinavian ones, still use only primarily a two-season division, equivalent to summer and winter (Latin vēr and hĭems, in the broad sense). The actual starting dates for these two seasons in these countries are traditionally St. Tiburtius’ day (14 April) and St. Callistus’ day (14 October). As we have seen, English only uses one of the Latin names for the seasons, namely autumn [ˈɔ.ɾəm], and then only primarily in some dialects. This word was borrowed into English in the late 14th century. The original name for this time of the year in Old English and Middle English was harvest, which autumn eventually replaced. The heart of the season is reckoned to be between September and November in North America, approximately, but in England, it is more like August through October. In North American English, autumn is a fancy word and the common name for that season is fall, which is short for fall of the leaf, a name that has been attested since the 16th century. The word spring is short for spring of the year and is also attested since the 16th century. The two-part seasonal division of the year is also found in Celtic languages, where the words for these two seasons tend to be cognates, whereas the word for spring and fall are more recent additions and vary from language to language. The division of the seasons in two is quite common around the world in countries in latitudes closer to the tropics, including in Spanish-speaking countries. In these countries, invierno stands for the tropical rain season that lasts between three and six months and verano stands for the dry season. The dates when the seasons are reckoned to start and end has also varied a great deal from time to time and from place to place, for obvious reasons having to do with the differences on when the weather changes. Nowadays, we use the dates of the equinoxes (around March 21 and September 21) and the solstices (around June 21 and December 21) for the starts of the seasons, but that is not how cultures have typically divided seasons. In Ireland, for instance, traditionally spring started on February 1, which coincided with St. Bride’s (or Brigid’s) day, a replacement for the pre-Christian Imbolc (Oímelc in modern Irish); summer started on May 1, May Day, a date traditionally associated with the Bealtaine celebration; autumn started on August 1, associated with Lúnasa (Lughnasadh); and winter on November 1, associated with Samhain. There is indeed a connection between the equinoxes and solstices and the varying temperatures during the seasons, in particular the solstices. That is because the temperature changes have to do with the varying tilt of the Earth towards the sun and the solstices are the times when the inclination is greatest, one way or another. The Sun’s rays hit the northern hemisphere of the Earth at the most direct angle during the summer equinox and at the least direct angle during the winter equinox. (The opposite is the case in the southern hemisphere.) 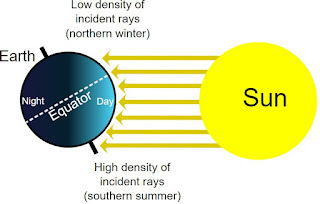 The weather associated with a particular season, however, does not come on the solstices, however, due to something known as the seasonal lag, which has to do with the large amount of heat or coldness retained in oceanic water. The lag may be of 2-3 weeks at the poles and as much as 12 weeks in lower latitudes. So, although spring (warmer weather) starts officially around June 21 in the northern hemisphere, the hotter days of summer do not come for a few more weeks. Likewise, we do not detect an automatic change for the better around the March 21 equinox, but rather a few weeks later. This explains why May 1st, or May Day, was considered the beginning of warm weather (‘summer’) in traditional cultures such as the Irish one (cf. Chapter 44, §44.6.6.3). There is also a noun primavera in English that refers to ‘the hard, light-coloured wood of a Central American tree (Cybistax donnellsmithii)’ (COED). This word should not be confused with the word for ‘Ireland’ in Medieval Latin, namely Hibernia (cf. the borrowed English adjective Hibernian, and the combining form Hiberno-, as in Hiberno-English). Lat. Hibernia is a corruption of an earlier Iverna, also spelled Iuuerna, Iuverna, and Iuberna in the Middle Ages, which was a loanword from Ancient Greek Ἰ̄έρνη (Īérnē), Ἰ̄ουερνία (Īouernía) or Ἱ̄βερνία (Hībernía), which is ultimately a loanword from Old Celtic *Iveriu, (accusative *Iverionem, regular stem: *Iverion‑), the source of Irish Eriu and Erinn, the name of the country of Ireland in Irish.